The Guelph Storm are proud to bring our Champions for Education program to over 30 local elementary schools in Guelph and the surrounding area every season. The program features two popular elements, the FUN FIT and Read to Succeed presentations, appealing to kids of all ages. 2016/17 Season: Guelph Storm players Matt Hotchkiss and Garrett McFadden share a cheer with Rickson Ridge Public School students during a FUN FIT presentation. Champions for Education gives Storm players the opportunity to excel as strong role models in the community, while reinforcing the importance of education, literacy, community, respect, kindness, anti-bullying, living a healthy and active lifestyle, nutrition, and so much more for students. 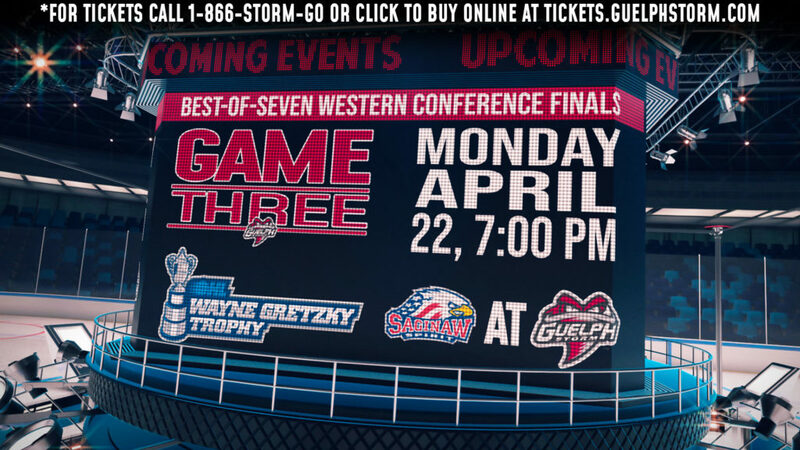 New to the program as of the 2016-17 Season, is the chance to pair Champions for Education with the Guelph Storm Anthem Program, giving local schools the opportunity to sing the anthem in front of a Sleeman Centre crowd prior to a game. As a thank-you, all students singing in the choir receive complimentary tickets, while all other tickets are sold at a fundraising group rate with $4.00 from every ticket going back to the school, incorporating a great fundraiser for 34 local schools in Guelph and the surrounding area! Every school also receives a visit from the Champions for Education program three-to-four weeks before their anthem date. For several seasons, the Storm’s “FUN FIT” presentation has been delivered to over 30 schools, promoting the importance of active minds and bodies with the junior and senior grades of local elementary schools of Guelph and the surrounding area. Focusing on the every day importance of a healthy and active lifestyle through good nutrition, healthy eating habits, and regular exercise, Storm players stand as role models in the community, proudly conveying these lessons while emphasizing that fitness can be fun! 2016/17 Season: Isaac Ratcliffe (left) leads St. Paul Catholic School in some squats, while Matt Hotchkiss and Garrett McFadden (right) run on the spot with students of Mitchell Woods Public School. 2016/17 Season: Storm captain, Garrett McFadden, presents FUN FIT to Erin Public School, sharing an average day in the life of an OHL player, his pre-game meal, the importance of hydration, and more. More than ever, playing hockey in the Canadian Hockey League demands a healthy lifestyle that includes strict fitness regiments and a healthy diet year round. As role models for healthy and active lifestyles, Storm players discuss their own experiences and the benefits of good nutrition and physical activity. Through this, students are able to gain a unique perspective on these issues from the players, who also spend time answering questions and signing autographs following the presentation. FUN FIT is more than words, as Storm players engage with students and encourage participation in an assembly-style format through questions, and demonstrating and leading the group in stretches and exercises that can be incorporated daily. The “Read to Succeed” program sees Storm players visit local elementary school classrooms to read with primary students, encouraging the importance of literacy and reading at an early age. Focusing specifically on students aged four to eight, Storm players sit down with young students and read from books provided by the Guelph Storm. Through reading hockey themed books which hold moral lessons, such as the “Brady Brady” series, players deliver positive messages including anti-bullying, being kind, and more, all while helping students to develop reading, creative writing, and comprehension skills. As role models in the community in many ways, Storm players understand and recognize they have the unique opportunity and responsibility to share the importance of education and literacy, especially with young students. This responsibility is something that all Storm players accept and utilize with great respect and pride. With programs such as “Read to Succeed,” Storm players are able to proudly give back to the community of Guelph. 2016/17 Season: Kyle Rhodes (left) reading to a classroom at Sir Isaac Brock Public School, and Givani Smith (right) with a class at Westwood Public School sharing a ‘Brady Brady’ story. If you’re interested in hosting Champions for Education at your school, or have any questions about the program, please contact Community Relations Coordinator, Stephanie Coratti, at scoratti@guelphstorm.com, or by calling (519) 837-9690, Ext. 108.